Flight to Bhutan is one of the most spectacular in entire Himalayas. Whether flying along the Himalayan range from Kathmandu or over the foothills from Kolkatta, each flight is a mesmerizing aeronautical feat and offers an exciting descent into the Kingdom. On arrival at Paro airport, immigration and custom formalities and then received by Bhutan Mindful Travels' representative and transfer to the hotel. Evening take a stroll around town’s main street. Overnight at the hotel in Paro. After breakfast, visit to Ta Dzong (National Museum) and then walk down the trail to visit Rinpung Dzong which has a long and fascinating history. Afternoon visit to Drukgyel Dzong, the ruined fortress from where Bhutanese repelled several invasion by Tibetan armies. Then visit a traditional farm house which offers good insight into lifestyle of local people. In the evening, visit Kyichu Lhakhang, one of the oldest and most sacred shrines of the Kingdom. Overnight at the hotel in Paro. After breakfast proceed to Thimphu, the modern capital town of Bhutan. Enroute stop at Chuzom (confluence) where Paro river joins Thimphu river. Nearby Thimphu, visit to Simtokha Dzong, the oldest fortress of the Kingdom which now houses the School for Buddhist studies. Afternoon, in Thimphu, visit to King’s Memorial Chhorten and Trashichhodzong, beautiful medieval fortress/monastery. Then, visit Handicrafts Emporium, Textile and Folk Heritage Museum followed by visit to local market. Overnight at the hotel in Thimphu. Morning, Thimphu sightseeing, visiting National Library, Painting School and Traditional Medicine Institute. After lunch, drive to Punakha, the old capital town of Bhutan. Stop enroute at Dochula pass (3,050m) that heralds the most enchanting views of Bhutan. On arrival, check into the hotel. Evening visit Punakha Dzong, the fortress of 17th century and later visit to Khamsm Yulley Namgyal Chhorten. Overnight at the hotel in Punakha. After breakfast drive to Gangtey via Wangduephodrang. Visit majestic Wangdue Dzong and interesting local market. Further ahead pass through dense forests and oak, rhododendron tress, reaching at Gangtey (Phobjikha). Evening take a walk around Gangtey village and visit Gangtey Gompa, the only Nyingmapa monastery in this region. Overnight at Camp / Guest House. Morning explore Phobjikha valley which is famous for Black Necked Cranes. The cranes migrate here from Central Asiatic plateau to escape its harsh winters. After lunch drive to Trongsa crossing 3,300m high Pele la pass. Evening visit to Trongsa market. Overnight at the lodge in Trongsa. 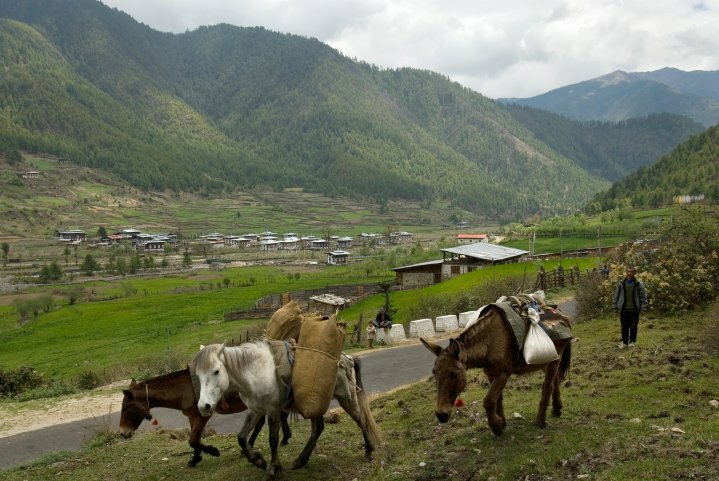 Bumthang is the general name given to combination of four valleys – Chumey, Choekhor, Tang and Ura with altitude varying from 2,600m to 4,000m. It is home to many of prominent Buddhist temples and monasteries. Visit to Tamshing Lhakhang, the treasure house of interesting religious Buddhist paintings. Then visit, Jakar Dzong, the administrative centre of the valley. Afternoon visit Kurje Lhakhang, one of the most sacred places. Later visit Jambay Lhakhang, the ancient monastery dating from the introduction of Buddhism in the country. Evening visit to local shops. Overnight at the lodge in Bumthang. Morning after visiting Bumthang market, drive to Wangdue . Lunch would be served enroute at one of the famous restaurant in Trongsa town. Evening take a stroll around Wangdue town, visiting shops, local market and mingling with people. Overnight at the hotel in Wangduephodrang. Morning excursion to Chimi Lhakhang, situated on a hillock in the centre of the valley, is dedicated to Lama Drukpa Kuenley, who in the late 15th century used humour, songs and outrageous behaviour to dramatise his teachings and due to this also known as ‘Divine Madman’. This temple is also known as the temple of fertility. It is widely believed that couples who do not have children and wanting one, if they pray at this temple, they are usually blessed with a child very soon. It is about 30 minute walk across field from the road to the temple. The trail leads across rice fields to the tiny settlement of Pana, meaning ‘field’. It then follows a tiny stream downhill to Yoaka and across more fields before making a short climb to Chimi Lhakhang. Afteroon drive to Paro. Overnight at the hotel in Paro. Start the day early for drive to Haa via Chele-la pass. 4 Km away at Bondey village the road to Haa diverts towards the right hand side and the climb up towards the chele-la pass starts. After driving through blue pine & rhododendron forest for 45 km, reach Chele-la pass ( 4200 meters). From this point one can have a superb views of Mount. Chomolhari & Jichu Drakey. This is a very good place to walk around for few minutes enjoying the view. Drive on to Haa, descending all the way for another 22 km (under an hours drive), finally reaching Haa. The Haa Dzong is presently occupied by military, but the view from outside is stunning. After picnic lunch visit to the famous Monastery Lhakhang Karpo (White Temple) followed by visit to Lhakhang Nagpo (Black Temple). The central shrine in Lhakhang Nagpo is said to have no difference with that of Lhasa JOWO in Tibet. The construction of the Lakhang Karpo is believed to have been assisted by the locality. As a result the place came to be locally known as “Hay” meaning “surprise” which later became “Haa” due to the differences in interpretations and pronunciations of different people over time. 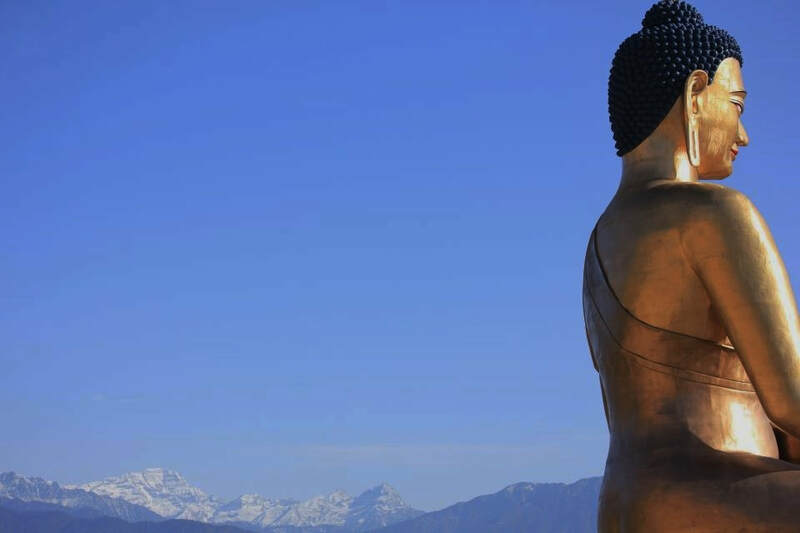 The three giant hills looming over the fringes of Haa valley were called “Me Rig Puen Sum” especially after the incidence of the Lhakhang Kdarpo construction. Today the three hills are popularly known as “Rig Sum Goenpa” signifying three deities-Jambayang Chana Dorji and Chenrizig. Later, other Buddhist saints like Guru Rinpoche and “Machi Labdorn” came to the Jungney Drag in Haa and blessed the locality. The principal religion followed is Drukpa Kagyud. After the arrival of Shabdrung Ngawang Namgyel, the chief guardian deity of Haa became Ap Chundu. Later in the afternoon drive to Paro same way back. The drive will be under 3 hours. Overnight at the hotel in Paro.